Landscape drawing encompasses anything that you perceive outdoors. Every one of us has a different landscape. I live in a rural city so I am surrounded by beautiful countryside but even if you live in a city, you can easily find interesting things to draw. You will accomplish more with your artwork by starting with little snippets that you find at random, like the path (image on right). Drawing small morsels is how you gradually increase your confidence and experience. It stands to reason that a small sketchbook is the most beneficial investment for you at this early stage. I like to use 2B, 4B and 6B pencils but you will ultimately decide what ones you like the best. I am attracted to fragmented pieces from our landscape because they are the things we take for granted and we completely miss their beauty as we go about our daily chores. My practice sessions for landscape drawing consisted of bits and pieces of trees, branches, grass and so on. The sketched portion of a tree here was a real joy to draw because it didn't require any concentration and I think the result is charming. It is only after a good amount of practice that I now have the confidence to tackle any subject. I learn from other artists as much as I can and if you do this too, I am sure you will discover it is very educational when studying individual styles. I really like the drawing books written by Barrington Barber and I have copied almost all of his drawings. There are numerous crisp, clear images in his books and I learned a lot from them. "Shoot for the moon -- even if you miss, you will land among the stars." 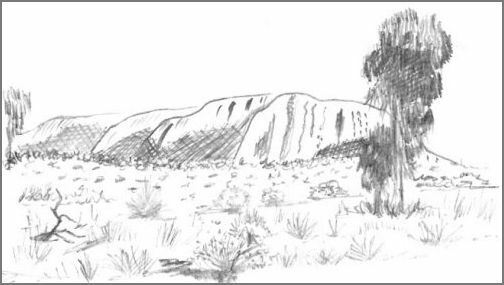 My favorite book out of his entire range is the one called The Fundamentals of Drawing Landscapes. 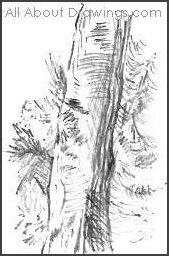 If you already have the book, you will recognize the tree sketch above which is copied from there. In this sketch, I practiced holding my pencil side-on because I can sketch faster and it removes the tendency to be fussy with my strokes. This is an excellent technique to complete a landscape drawing quickly! The texture of the paper you use definitely makes a difference to a sketch - in this instance, I used my sketchbook which was an A5 (5" x 7") size. I like the sketch because when I look at it, I get the sense of the wind rustling through the trees! I will definitely use this style again in the future. located in the Northern Territory, Australia. I was comfortable and relaxed with plenty of time up my sleeve when I created this drawing. 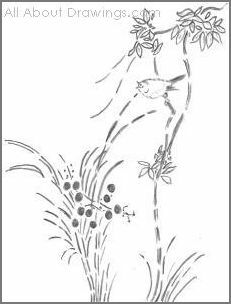 The leaves on the trees appeared to be long spindles so I used up and down strokes. There is no need to illustrate individual leaves unless you are doing something like a close, dedicated study of one branch. The long, dry grass in the foreground was lightly sketched in but, unfortunately, it isn't very visible after scanning. The next day, as I gazed at my drawing, I wondered if I could complete the same drawing in a short amount of time, while still holding my pencil in a writing grip. When I stand up and draw, this unrelaxed state delivers a drawing that surprise me because I still end up with a reasonable image. It's kind of like a lesson that shows anything is possible when some kind of effort is applied. It is very rough but I achieved the sketch in 15 to 20 minutes. With more practice, I am sure to reduce that time further but in my mind I passed the test. Create challenges for yourself like this because it is an extra push towards improving your skills. To keep with the theme of my 'shorthand' landscape drawing, I used cross hatching instead of layering for the shadows on the rock. To create darker shadows, the lines need to be close together. If you want shadow that isn't so dark, place the lines a little further apart. In my reference picture, the shadow on the rock was black so in my haste I didn't reflect the shadow very well. Constant and gradual improvement is a key point in reaching your goals. 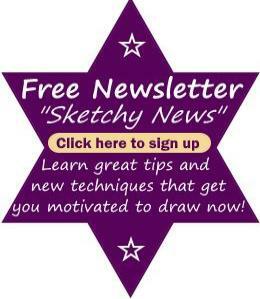 If you are not quite satisfied with your drawings, this is good news because it means you will strive to do better! It sure beats becoming stagnant. Every time you make a correction in your landscape drawings, think of it as being one step closer to being the best you can be. If you love to go outdoors to draw landscapes, a viewfinder reduces an overwhelming view into a tiny picture. You then select the portion that appeals to you the most. Move the viewfinder closer to your eyes to see more of a view or move it further away to see less within your frame. The fun begins once you decide upon your scene. If there is anything you don't like, just leave it out. Drawing from a high point is difficult due to all the different sizes of buildings, trees, etc, which in turn gives the illusion of distance. Note to self - don't try this for a while! 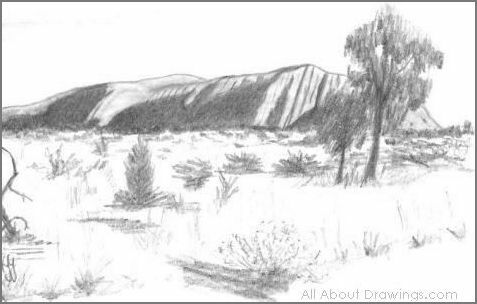 Once you become familiar with landscape drawing, you become more aware of proportions. A typical helpful aid is to measure one thing in your drawing (like a tree) and compare it to the size of everything else (maybe buildings) within the drawing. This is an easy way to portray and judge the size of objects. Allow yourself plenty of time to learn proportion and you will be fine. Barrington Barber books showed me how to translate real life images into simple drawings and I appreciate the helping hand! The book pictured here is the one that I use frequently (although mine is an earlier edition) and I just love it. I think I am able to draw landscape more successfully thanks to my Barrington Barber books. I studied his style and noted how he portrayed landscapes up close and further away. Even after you have had long experience in drawing, you still find significant points of value if you keep reading and learning. Simple practice work in landscape drawing is important to progress plus it helps us to overcome bad habits. 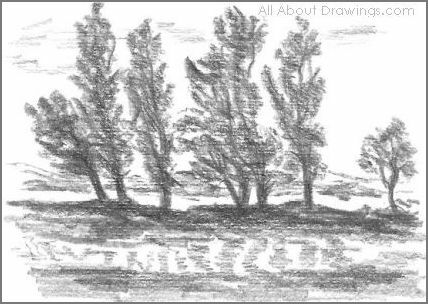 Pencil drawings of landscapes will bring you much pleasure, go on, try it out and see if I'm right!.